The torch held by the front runner provides the main source of yellow-white light for this scene. 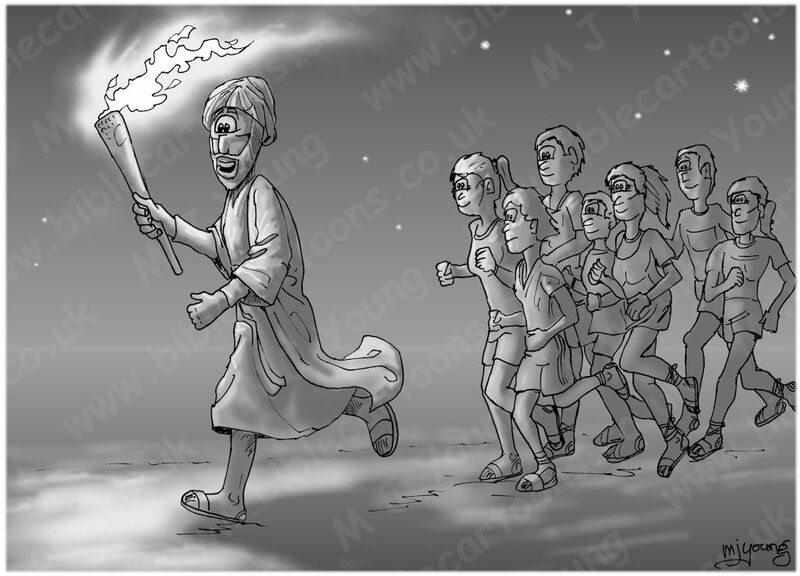 A man running along a beach at night, carrying a torch, followed by children running behind him. Psalm 119 is an example of a Wisdom psalm, which probe life’s mysteries to teach the congregation about itself & God. This scene was drawn on 12th July 2012, in the run up to the Olympics in London (excuse the pun.) In it’s original form I produced a greyscale drawing – a black & white, pen & ink drawing, using only shades of black, white & grey (see below). This is the same picture, with various shades of blue & yellow introduced. Here’s the scene in the original greyscale form. Although intended to celebrate the Olympic torch, this scene is also a depiction of the Bible (God’s Word) which similarly illuminates a Christian’s path & helps us to run confidently into the future. You will need to scroll down that page to see the picture!